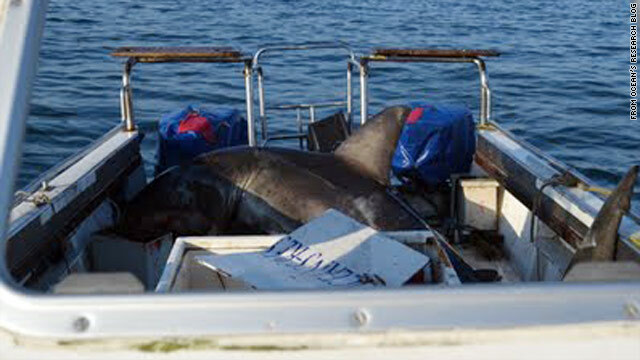 The 1,100-pound great white shark sits in the stern of a South African research boat. Shark researchers in South Africa didn't have to go far Tuesday to find a specimen - a 10-foot great white shark leaped into the back of their boat. And rather than a story of the big one that got away, this is a story of a big one they couldn't get rid of. The boat, from Ocean's Research in Mossel Bay on South Africa's southern coast between Cape Town and Port Elizabeth, was chumming in the waters around Seal Island and monitoring the activity of four sharks as part of an ongoing study, researchers reported on their blog. “Next thing I know I hear a splash, and see a white shark breach out of the water from the side of the boat hovering, literally, over the crewmember who was chumming on the boat's port side,” field specialist Dorien Schroder wrote on the blog. He pulled the crewmember to safety while others jumped out of the way of the 1,100-pound shark. Schroder said the shark landed with only half of its body on the boat, and the crew hoped it would slide off. This shark, however, wanted to hang around. The shark thrashed about and became stuck in a 5-by-6.5-foot area on the stern of the boat, cutting the vessel's fuel lines in the process. Schroder's crew on the Cheetah radioed for help from other researchers aboard the boat Laminade. Schroder poured water on the shark's gills to keep it alive as they waited 15 minutes for help to arrive. Researchers then tied a rope around the shark's tail and tried to use the Laminade to pull it off the Cheetah to no avail. After the Laminade towed the Cheetah back to port, a water hose was inserted into the shark's mouth to keep it alive as a fishing boat used its crane to lift the animal by its tail and drop it in the harbor. Shark tale over, right? Not quite. About a half hour later, the researchers found the shark beached on a small area in the harbor. Two researchers, Enrico Gennari and Ryan Johnson, tried to walk the animal into deeper water. The shark was having none of it, but the researchers weren't about to give up. The attached ropes from their boat to the shark's tail and pectoral fins, tilted its head up so its gills could work properly, and towed it about a half-mile outside the harbor, where the shark regained strength and swam away. "It is impossible to predict everything that can happen," they said on the blog. "What is important is how you respond to such situation. No one was injured and the shark survived, this is a credit to our team, the port authorities and members of the community who assisted." And they do have a whale of a shark story to tell their kids. Agghhh That's crazy and scary!! If you really want to to hear/see some behind the scenes stories what Sharkmen on National Geographic. Chris Fischer sat down and told BDOutdoors what its like to hunt Great White Sharks (<-click that)and produce the show.